Mechanical engineering student Mike Sanders wanted to know why prosthetic technology was good enough to allow amputees to compete in the Olympics alongside athletes who had all of their limbs, but not good enough to help temporarily injured people. He had a good point: if a person loses a leg he can get a new one that works even better than the original, but if a person breaks an ankle he has to hobble around on archaic crutches (and don’t even get us started on those ridiculous looking knee scooters). So Mike Sanders gathered a team of like-minded students and set out to right that wrong. 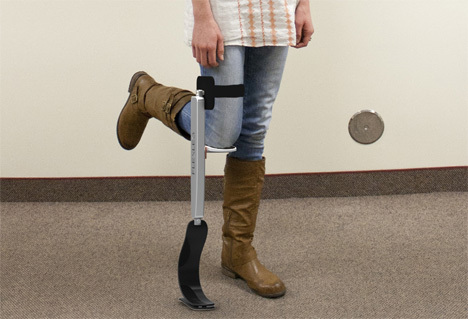 They came up with FlexLeg, a very different type of assistive device that helps people with lower leg injuries get around easily and without using their arms. It is, more or less, a temporary prosthetic lower leg. The injured person rests his knee on the FlexLeg’s platform and a strap around the thigh holds the device steady. The injured leg is held out to the back, and the FlexLeg takes its place. We can imagine that wearing the FlexLeg for long periods of time would get kind of uncomfortable, but probably nowhere near as uncomfortable as using crutches. Stairs and tight spaces are no longer a problem for people with leg injuries since the FlexLeg takes up no more space than an actual leg (minus the temporarily useless leg sticking out at the back). 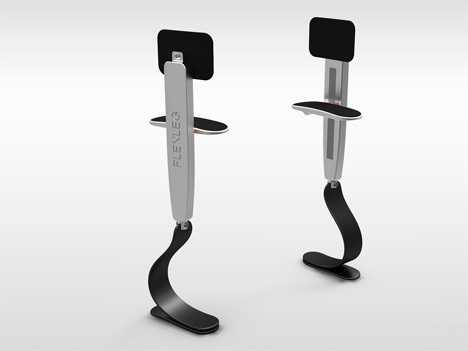 After winning a slew of design awards for the innovative creation, the team behind the FlexLeg is now developing the concept for market.